The KAAY Chart out of Little Rock, Arkansas, listed "Vehicle" by The Ides Of March at #1 this week. (You'd expect to see that in Chicago, where it also topped the chart ... albeit a full month earlier!) Incredibly it doesn't make the KAKC chart at all and lists at #22 on the L&H Chart! This second chart comes from the Lyon and Healy Store ... now my recollection of Lyon and Healy was that they sold pianos and organs ... and sheet music ... and gave lessons on this equipment. I never really thought of them as a source to buy the latest hit records ... but maybe that's because the small branch I used to visit in Hillside, IL, just wasn't set up for these things. Then again, their chart may have been published a bit earlier ... "Let It Be" by The Beatles was still showing up at #27, some two months after it peaked nationally ... their follow-up single "The Long And Winding Road" was already climbing the charts everywhere else. (KAAY shows it premiering at #25 this week while the KAKC Chart shown below already shows it slipping from #7 to #8 in its fourth week on the chart.) The Lyon and Healey Chart posts it at #9, designating it as the Hit Of The Week. KAKC (The Big 97) was based out of Tulsa, Oklahoma ... they had Blues Image on top of their chart with "Ride Captain Ride". (It was #3 in Little Rock and WAY down at #54 on the L&H Chart). Three Dog Night took a HUGE leap this week from #13 to #2 ... and the latest hits by Steppenwolf, Melanie, Paul Davis, Leon Russell and The Sandpipers also saw a significant upward movement. 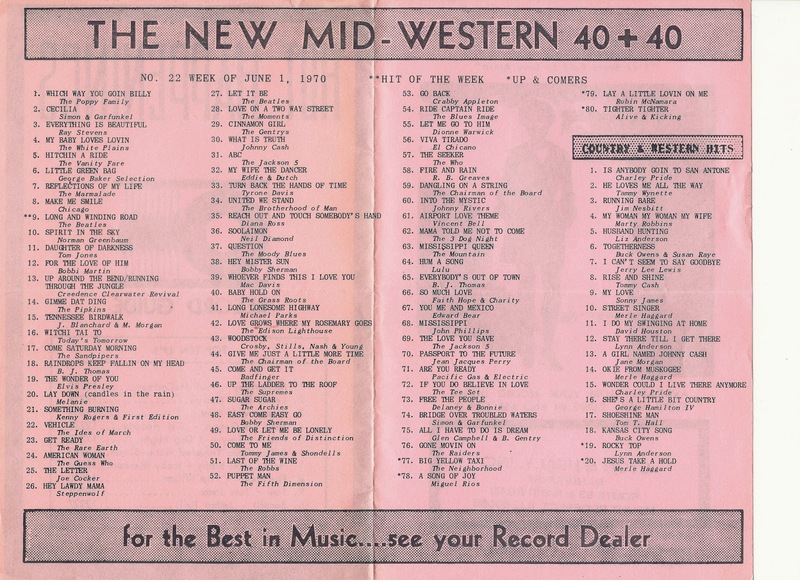 Elvis' latest, "The Wonder Of You" was all over the place based on these charts ... premiering at #30 in Tulsa, OK, up five points to #16 in Little Rock, AR and #19 on the "Midwestern Chart" published by Lyon and Healy. It's charts like these that show you why we all remember how big any given record was based on where we grew up hearing it. KAKC shows Paul Davis' version of "A Little Bit Of Soap" as a big hit ... yet it only peaked at #52 in Billboard ... and it doesn't even show up on the other two charts posted today. Note some of the "local hits", too ... "Friends" by Feather, "My Wife, The Dancer" by Eddie and Dutch and "Genesis - Last Chapter" by Terry McGovern are all titles that leave most of us scratching our heads. (Meanwhile, look how well The Gentrys' version of the Neil Young classic "Cinnamon Girl" was doing ... #14 (down from #3) in Oklahoma and #29 on the Lyon and Healy Chart ... yet another #52 peaker in Billboard. LITTLE GREEN BAG - The George Baker Selection - #6 on the L&H Chart but not listed on either of the other surveys. As well as SUGAR SUGAR, LOVE OR LET ME BE LONELY, UP THE LADDER TO THE ROOF, WOODSTOCK, LOVE GROWS, COME AND GET IT and EASY COME, EASY GO. So how do you determine the REAL, legitimate hits with this kind of discrepancy amongst the charts? And that's what made radio so fun and exciting back in the day ... as we can see by just scanning these random charts, that meant that the other six could be almost ANYTHING!!! "Mississippi Queen" by Mountain or "Ticket To Ride" by The Carpenters. "Hey Lawdy Mama" by Steppenwolf" or "Puppet Man" by The Fifth Dimension. Whichever way the station decided to go was totally fine by us ... we loved it ALL! THE BEATLES regained the top spot this week on the Billboard Hot 100 Pop Singles Chart when LOVE ME DO hit #1. A WORLD WITHOUT LOVE by PETER AND GORDON climbed to #7 and LITTLE CHILDREN (by BILLY J. KRAMER AND THE DAKOTAS) to #8 … and that wrapped up the British control of The Top Ten. Sitting just outside (at #11) was P.S. I LOVE YOU and DO YOU LOVE ME (#12). THE BEATLES and THE DAVE CLARK FIVE also had other hits in The Top 20 this week ... BITS AND PIECES was right behind at #14, DO YOU WANT TO KNOW A SECRET was at #19 and DIANE by THE BACHELORS sat at #20. Those eight hits reflected the least amount of British occupation in The Top 40 in quite some time. CAN'T BUY ME LOVE fell to #42, GOOD GOLLY MISS MOLLY (by THE SWINGING BLUE JEANS) sat at #46, DON'T LET THE SUN CATCH YOU CRYING (by GERRY AND THE PACEMAKERS) climbed to #47 (up 40 points! ), THE SEARCHERS' original version of of SUGAR AND SPICE jumped to #50 and I KNEW IT ALL THE TIME (another DC5 hit) sat at #54. Meanwhile, a GREAT new song by THE SEARCHERS, DON'T THROW YOUR LOVE AWAY, premiered at #69 and BAD TO ME, the flip-side of BILLY J. KRAMER's hit LITTLE CHILDREN debuted at #71. (BAD TO ME was a stand-alone #1 Hit in the U.K. It's another one of those songs written by … and given away by … LENNON and McCARTNEY.) CHAD AND JEREMY's version of YESTERDAY'S GONE leaped from #92 to #72 while THE OVERLANDERS' take moved to #87. Meanwhile, THE ROLLING STONES held steady at #82 with NOT FADE AWAY. Here in Chicago, it was mostly the same line-up as last week on the WLS Silver Dollar Survey chart ... "Love Me Do" / "P.S. I Love You" was at #1, "Yesterday's Gone" came in at #4, "Little Children" / "Bad To Me" at #5, "Diane" climbed to #8 and Peter and Gordon jumped to #10 with "A World Without Love". "Do You Love Me" held steady at #17 (after such a dynamic start), "Good Golly Miss Molly" was back up on the charts at #21, "Not Fade Away" sat at #23 and "I Only Have Eyes For You" by Cliff Richard was at #24. On television, The Dave Clark Five were back on The Ed Sullivan Show on May 31st, performing their latest hits, Do You Love Me and Can't You See That She's Mine. As May draws to a close, let's take a look back at some of the records that topped the charts on this date over the past 60 years! However by 1956 Rock And Roll had its first major superstar ... Elvis Presley sat on top of The Billboard Best Sellers Chart with his first big break-out hit "Heartbreak Hotel". #1 on May 29th, 1959 was "Kansas City" by Wilbert Harrison. The Everlys were back on top the following year as "Cathy's Clown" ushered in a new decade ... and new record label ... for the Dynamic Duo. In 1961, Ricky Nelson sat on top with "Travelin' Man", a song we featured recently in our Saturday Surveys feature. 1962 brought us the instrumental hit "Stranger On The Shore" by British Import Mr. Acker Bilk ... two years before The Beatles officially ushered in The British Invasion. 1963 brought us the novelty hit "If You Wanna Be Happy" by Jimmy Soul, a record that STILL sounds catchy as hell 51 years later! And in 1964 it was Motown's Mary Wells who held down the top spot with her timeless classic "My Guy", written by Smokey Robinson. (To show no gender prejudice whatsoever, a year later he'd write another #1 Hit for The Temptations called "My Girl"!) And, as you'll see tomorrow in our "50 Years Ago This Weekend" feature, The Beatles would take over the top spot on May 30th with "Love Me Do", a record first released back home in England 20 months earlier! The Summer of Love was only weeks away ... and in 1967 we were "Groovin'" to the sounds of The Young Rascals. A year later kids were dancing to "Tighten Up" by Archie Bell and the Drells. (Archie was in Viet Nam the first time he heard his first hit record!) And in 1969, The Beatles closed out the decade with their latest, "Get Back". Another Chicago-based group would top the chart in 1975 ... the #1 Record in America on May 29th, 1975 was "Shining Star" by Earth, Wind and Fire. In 1976 Diana Ross would have one of her biggest solo hits when the disco-tinged "Love Hangover" became the biggest hit in the nation. Motown labelmate Stevie Wonder had the top honors a year later when "Sir Duke" topped the chart. Paul McCartney had the #1 Record on May 29th, 1978, with "With A Little Luck", a record you don't hear all that much anymore. In 1979, the reunited Peaches and Herb (actually just Herb with a brand new Peaches) held down the top spot with a song appropriately titled "Reunited". The 1980's began with New York / New Wave punk rockers Blondie at #1 with "Call Me", a song featured in the Richard Gere film "American Gigilo". In 1981 Kim Carnes was two weeks into her ten week run on top with her landmark hit "Bette Davis Eyes". In 1982, previous May 29th chart-toppers Paul McCartney and Stevie Wonder teamed up to give us "Ebony And Ivory" ... not the strongest outing for these two mega-artists. A year later another movie tune topped the charts ... this time it was "Flashdance - What A Feeling" by Irene Cara. Another year later and it was "Let's Hear It For The Boy" from "Footloose" that topped the chart (a #1 Hit for Deniece Williams) and in 1985 the top honors went to Wham! (featuring George Michael and Brian Dunkelman ... no wait ... that was the forgettable cohost of "American Idol" the first season ... I'm thinking of the just as forgettable Andrew Ridgeley ... which would make that the first time that ANYBODY has thought of Andrew Ridgeley since ... oh, about 1985!!!) for their hit "Everything She Wants". 1986 gave us the incredible voice of Whitney Houston at #1 (with yet another movie song), "The Greatest" (from the Muhammad Ali bio-pic of the same name). Rock supergroup U2 was already making their mark in 1987 when "With Or Without You" topped the Pop Singles Chart. And in 1988, George Michael was back on top (as a solo artist this time) with "One More Try". Speaking of "American Idol", original judge Paula Abdul had her second straight #1 Record (out of an incredible six in a row!) when "Forever Your Girl" topped the charts on May 29, 1989. And in 1990, it was Madonna on top with "Vogue". For the record, I look forward to the Saturday Surveys every week. As a long time radio station survey collector, I find the various stations, many of whom I am previously unfamiliar with, to have interesting and fascinating information especially regional and local records that I was previous unaware of. Please keep this feature! I do not get the chance to study each Saturday Survey, but I enjoy perusing them and getting a feel for each time-frame represented. Carry on if you will. If you choose not to ... I will still be on your site daily. I love the Saturday surveys and hope you keep them going. I don't wanna create more work for you by transcribing them to text though, so keep those comments on them coming on Saturdays. It's a great feature and Oldies freaks should love them. Keep 'em. I scan each day's report, but spend more time looking at the old charts ... it's an emotional experience. BTW, the old adage may be true about not appreciating things in one's own back yard. I live about five blocks from the Arcada Theatre and rarely get there. It's too claustrophobic for me. I used to be friends with the son of one of the owners back in the 60s and had many backstage tours then, even operated the projection booth a few times. Please keep the Saturday surveys! I really enjoy being able to see where a song was at a given time. Songs always evoke memories and having that info really enhances the reminiscing. I can see where the survey feature can get boring for those who aren't into it. But for those of us like you and I, and mutual friends, it's interesting to see what songs were huge hits, when they were mere blips in our respective towns. And what songs were blips everywhere but in Chicago. I just got is about 180 charts the other week and just when you think you've seen every variation there is, up pops a survey like the one from KING Seattle, which I sent to you, that had features I had never seen before. I think as long as you don't over do it and try to space out the years, I think you should keep on doing the feature, or switch to another day and take Saturday off. on it and you have to drop it, then I for one would understand. Your posting of Seattle's KING radio survey showed that song position #20 was Tex Ritter's (I DREAMED I WAS IN ) HILLBILLY HEAVEN. That record was big also here in OKC but I remember that Tex Ritter re-recorded it using names of the various DJ's who were working here in OKC at the time on the station that was playing it. I assume he did this as well for other stations around the country. I of course do not have a copy and really don't know of anyone here in OKC who does. I watched the CBS Sunday morning show this morning and they had a segment about Barry Gibb. He is touring solo for the first time. What I liked about the story is that one of his sons ... a heavy metal guitar player ... and Maurice's daughter are touring with him. Barry and Maurice's daughter sang "The First of May" together and it was fantastic. Seeing this helped take some of the sadness out of the loss of Robin and Maurice. Barry seemed happy, too. 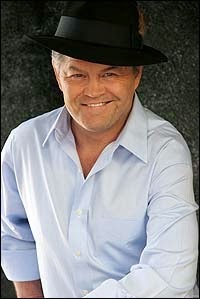 New York – Actor, writer, director, performer MICKY DOLENZ (of The Monkees) has been confirmed for the lead role in Mike Reiss’ new play Comedy Is Hard! , premiering Wednesday, September 24, at The Ivoryton Playhouse in Ivoryton, Connecticut. A renaissance-artist of the highest order, Dolenz has continued his recording career as well, most recently with a solo album entitled Remember, released last year. He’s also participated heavily in the several Broadway charities; most notably for Rockers On Broadway. In fact, he was just announced as recipient for their yearly award; to be presented in November. Reiss, the acclaimed writer of I’m Connecticut and writer and producer for the animated series The Simpsons; also created the animated series The Critic. He’s also written the webtoon Queer Duck and worked on the screenplays for Ice Age: Dawn of the Dinosaurs; Horton Hears a Who! ; The Simpsons: The Movies; and, My Life In Ruins. Well, there are at least two different stereo mixes of the song that Abkco has released ... the more recent one was remixed to sound more like the original mono 45, but in stereo. Perhaps after hearing the 1980's stereo mix for so long, you've forgotten what the original 45 version even sounds like ... so a remix that is closer to it than the original mix might not sound right to you. The New York / New England regional Beatles festival, "Danbury Fields Forever," will "come together" Saturday, July 26 & Sunday, July 27, 2014 at Ives Concert Park in Danbury, Connecticut. Doors will open at noon, and the music will continue until 8 pm daily. The Music, Foods & Arts Festival is in its third year, with 10 bands per day playing the music of The Beatles, solo material and songs from the 60s. The full line-up of performers has been announced. Acts include The Hofners, The Oh-Nos, The Mystery Tour, AfterFab, Fools On The Hill, Charlie Guitar, Studio Two, Beatlehead, Thunder Road, The Way-Back Machine, Rotary and the national touring group Beatlemania Again. There will be live tributes to George Harrison by Pete Santora (formerly of Broadway's "Beatlemania"), Sir Paul McCartney by Mike Miller's "One Sweet Dream," John Lennon by Dave Pal in his "Lennon Legacy" show and to Elton John by Bill Connors. Students from School of Rock in both New York and Connecticut will have their star students performing sets of Beatles classics. Also, the winners of the web talent search project StarOnTheWeb.com will be performing. To celebrate the 50th Anniversary of The Beatles' U.S. arrival in 1964, one-day "Ticket to Ride" admissions to the Festival start at only $19.64, but these special discounted early-bird advance prices are only good until May 31st. Advance ticket available at: https://www.eventbrite.com/e/danbury-fields-forever-iii-tickets-11495548495. There are also V.I.P. tickets available, discounted two-day passes and hotel packages. Tickets will be higher at the door. Ives Concert Park is located at 43 Lake Avenue Ext. on the campus of Western CT State University in Danbury, CT. This year there will be more Beatle and memorabilia dealers and vendors, exhibitors, along with a larger variety of food options available. For guests staying overnight, there is a reduced rate hotel package which includes accommodations and breakfast for only $79 per night. Visit www.Fab4MusicFestival.com and check the FAQ page for hotel info. The weekend's MCs are Ken Michaels of the "Every Little Thing" radio show and Gary Theroux of RewoundRadio.com's "History of Rock 'n' Roll." "Danbury Fields Forever lll" is presented by Charles F. Rosenay!!! 's Liverpool Productions, the same company that presented "NYC FAB 50," The Beatles' 50th Anniversary Celebration in New York City in February, and organizers of the annual Magical History Tours to Liverpool & London (www.LiverpoolTours.com). A portion of ticket proceeds will benefit a designated charity. As The Beatles sang, "It's guaranteed to raise a smile." A lot of people have been calling and emailing about where they can get a copy of the "The Wages Of Spin II - Bring Down That Wall" DVD. Well, I am happy to report that you can pre-order it thru our company site for delivery this Summer at www.characterdrivenfilms.com. We have industry screenings coming up at The Great Minds Salon Series in Beverly Hills and Film Media (L.A.) in late June. We will be meeting industry reps at the screening in June and will probably decide who is going to distribute the film during that week. There is a lot of media coming up over the course of the next several weeks. Here is the link to The Daily Mail News Site (U.K.) Feature on Wages of Spin II "Bring Down That Wall": http://tinyurl.com/laauz27. The Daily Mail News Site is the most visited News Site in The World taking 11.7 Million Hits Daily. Bobby Rydell relives his "Wildwood Days." I know you're not a Facebook guy ... but TJ Lubinsky recently started posting Doo-Wop Wednesday. And this is a real shame ... it sounds like Ron Riley had to bow out of his Hard Rock hosting duties on June 24th due to health reasons back home in Baltimore. (His wife is ailing and he wants to be there with her during this time.) Meanwhile, Clark Weber assures us that he will soldier on alone ... and believe me, he'll have some GREAT stories to tell from the podium that day! More details are still to come ... but all of this ties into Ringo Starr's brand new Art Exhibit which will be on display (free of charge) at The Hard Rock Cafe Chicago. Ringo caps off the week-long event with his concert at The Chicago Theater on June 28th (with his All-Starr Band).